Just pushed out an update to the Adobe Illustrator MultiExporter script that lets you specify if you want to export PNGs and JPGs at a different scale factor so that you can generate versions of the images at double resolution for iPhone retina displays. 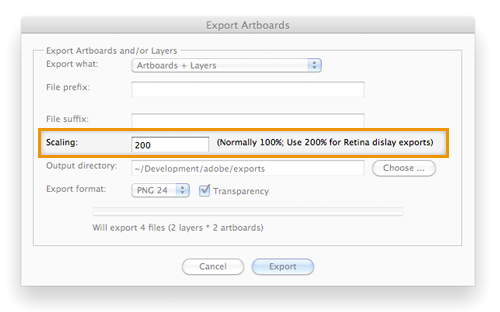 The option is set in the “Scaling” field in MultiExporter dialog box: Leave it at “100%” for normal exports, set it to “200%” for double-resolution exports. You’ll probably also want to set a prefix or suffix or the file name, too, so that you can keep the files separated from the normal resolution ones. The script is available here — MultiExporter.jsx — and also in my Illustrator Scripts repository on github. Excellent script. Is there any hope for svg support? I was searching the script that can save illustrator layers to separate .svg files with no success. I will try to integrate .svg exportation to this script. Great script idea, but I don’t see options for setting JPEG quality or actual image resolution (scaling is not exactly the same thing). Any chance that could be added to the script? The script seems to assume all JPGs and PDFs are for web (low res) use – what about 300 ppi, etc.? Hmm, according to the Adobe script reference for CS 5, I don’t see a reference to actual resolution for script commands for exporting PNG or JPGs, just a scaling percentage. It does look like there is an actual resolution (dpi) that can be set when scripting export to Photoshop. That would be kludgy, since getting a high res JPG would be a two step process then. Is there any way to choose the PDF preset for the export? Have given this a try but it doesn’t seem to work. No matter what settings I use in the dialog box, at the bottom it always says something like “will export 0 of 9 artboards” or “will export 0 of 4 files” and does nothing. Could it be that this script is not compatible with CS6? : error 21 – Undefined is not an object. the script input box doesn’t even load. So – It refuses to generate the files. Anyone cast a light on this? When I use the script however, all I ever get is a single file representing the whole series of steps. Do ALL of those art pieces need to be on individual Artboards? Thanks! This is super useful !! Thanks ! Is there a way to modify the script, so that if I enter ###_ in the prefix, it sets the artboard number in the name ? Wow – what an awesome tool – especially now with iOS 7’s new simplistic icon look. I’m eschewing Photoshop in favor of Illy more and more. This script is a lifesaver!! Thank you!! Given that you added an @2x field – guess you work on developer projects. If so, you may be interested in an Applescript app I wrote a few years ago for drag and drop downsampling of @2x files via Photoshop. If so, shoot me an email and I’ll send it to you. Just wanted to give back a little – MultiExporter will become an oft-used tool for me. BTW – nice touch with the persistent defaults on a layer! Under the section that defines the ExportOptionsJPEG object.